Satazius is an apt reminder, in an age of high-gloss cinematics and endless beige warzones, that gameplay remains king. 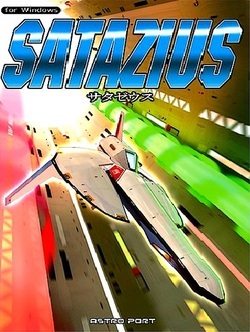 It doesn’t look a million dollars, and lacks a defining gameplay mechanic in the mould of Ikaruga’s black and white fire or Psyvariar’s Buzz system, but in delivering absorbing, energetic shoot ‘em up action by the bucket-load, Satazius has it where it counts. The narrative sends us on another trip into the near but unrecognisable future as the planet Satazius comes under attack from space pirates. Lots and lots of them. They attempt to steal the combat ship Trafalgar, and after its crew narrowly avoid going down alongside the giant cruiser Agano, they’re faced with the formidable task of taking on these astro-bandits single-handedly and with increasingly long odds of escaping in one piece. But that’s where you come in. Satazius won’t bowl you over with bombastic cinematics or visual dynamism. Graphically, it’s unremarkable but not unattractive, so whilst it’s unlikely you’ll think too hard on the definition, clarity or special effects that are on show, you will appreciate the large, fluid and busy environments that, in the vein of R-Type, pose nearly as much of a hazard as the pirate ships. Indeed, the biggest compliment the presentation (and by extension, the game itself) can be paid is that it feels somehow timeless. It’s as if you could set it down at any point from the early nineties right up to the present day, and it wouldn’t feel out of place. Inspired by (and very much reverential of) a genre still proudly rooted in its arcade sensibilities, Satazius never comes across as dated or overtly imitative, it’s very comfortable in its own skin. 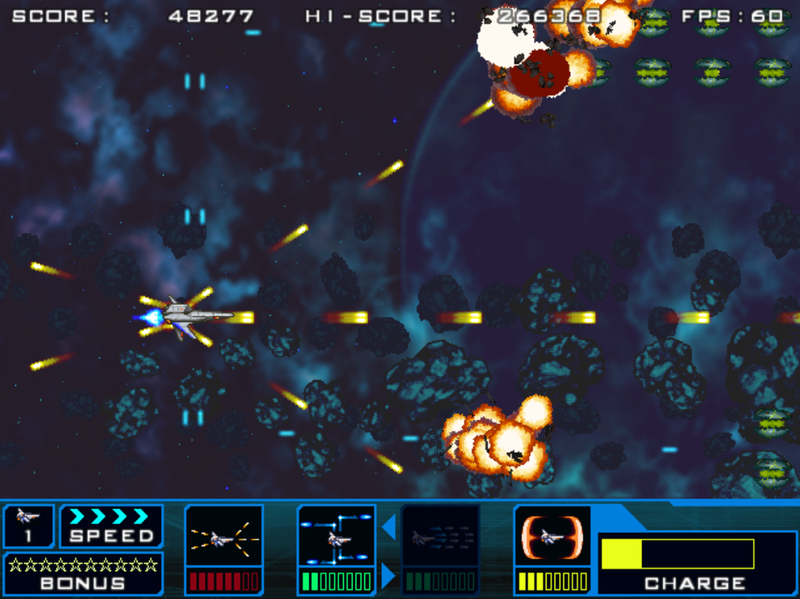 Astro Port have taken the base of a relatively standard side-scrolling shoot ‘em up and polished all the bits that needed polishing. Consequently, what Satazius lacks in surprises it makes up for in sound craft and measured challenge. It’s no bullet hell, but one-hit kills (two if you are lucky enough to acquire a shield power-up) will see you heading back to the previous checkpoint with marginally diminished power-ups. This allows for just about the right degree of difficulty; the bosses are particularly good and none are especially cheap (although you might struggle with the first one a few times), though the fragility of the Trafalgar and the crafty but manageable tactics the A.I. employ means you’ll need some real joypad dexterity to progress. The seven stages offer a pleasantly broad (if not especially original) range of settings and foes. It’s good, uncomplicated fun, with razor-sharp controls, decent collision physics and some devious level layouts that branch at various points to keep the player guessing on additional runs. There are a total of four skill settings to tackle should the initial two not prove a meaty enough challenge, and so relative to its genre stablemates, its good value. Smart design extends to the weaponry, with more than dozen weapons to mix ‘n’ match. They’re split into sub-sections, with various standard-fire forms accompanied by two interchangeable, additional secondary fires and a chargeable special attack that is useful as a screen-clearer or for heaping misery on those pesky bosses. And they aren’t just for show either, as different combinations yield different results depending on the level. The memorable closing phase of the opening level offers a good example; in a prelude to the first boss battle, you’re chased through cavernous surrounds whilst also having to mind out for falling rocks and the pursuing ship firing missiles at you from behind. 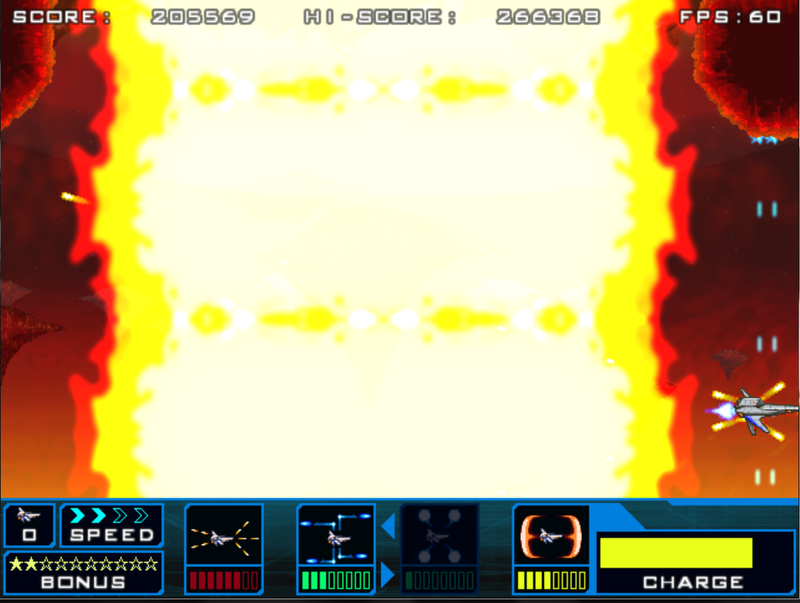 This is where splayed, less-focused fire is handy as you can shoot diagonally and backwards, taking care of their missiles. Equally, later on you’ll face large, stationary bosses that can be tackled head-on with rows of missiles that offer less peripheral protection but can be monstrously destructive. The thumping techno sci-fi strains are distinctive and suitable, and bar the occasional annoyance – like crashing into hatches that open and close within already-tight tunnels – there’s nothing serious that can be levelled at Satazius. 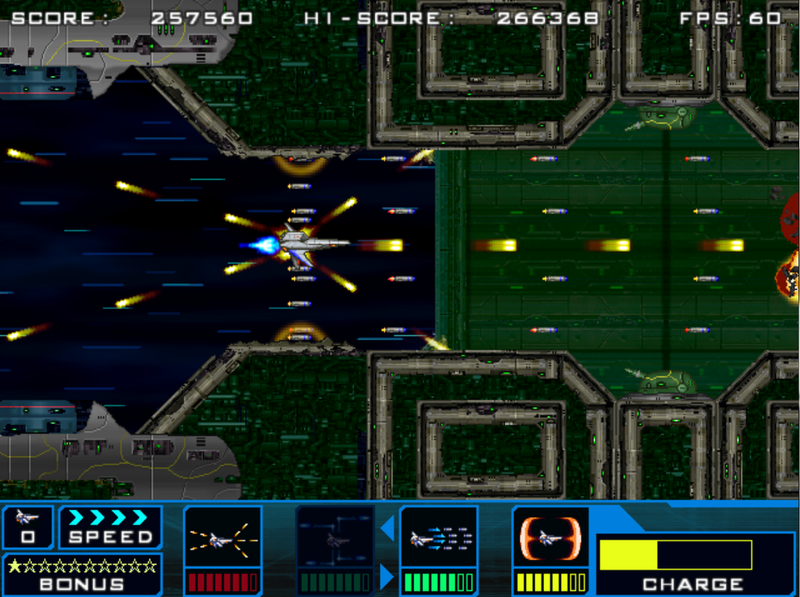 Probably the game’s biggest problem is that whilst its base gameplay is superior to the majority of the side-scrolling shooter titles that have started to populate Steam and the PC community in recent times, its unwillingness to think outside the box either thematically or in terms of the play mechanics means it’s hard to see it as a standout choice. That said, Astro Port have done a remarkable job with such a small development team and there’s a lot of affinity on show for the greats of the genre. 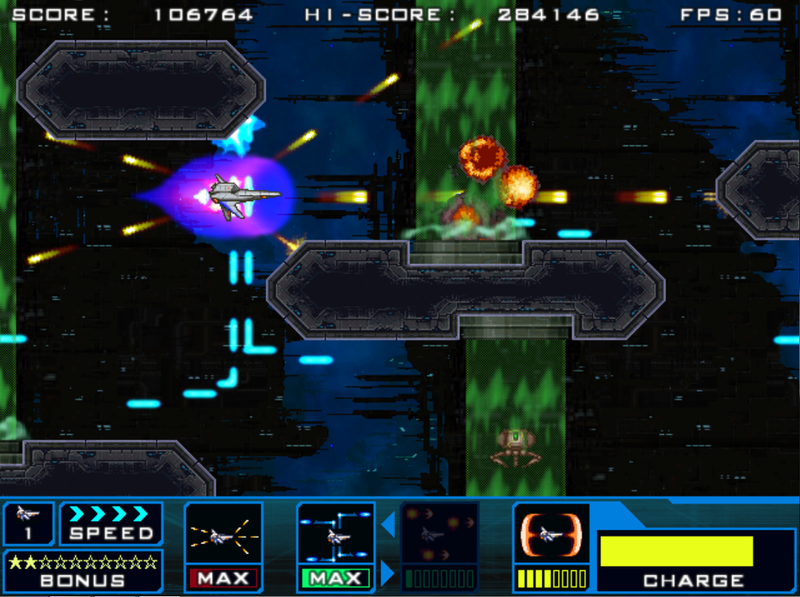 With labyrinthine, tight levels that have echoes of R-Type and ship, enemy and power-up models that each bear more than a passing resemblance to those seen in Konami’s Gradius titles, this may prove an ideal fusion for fans of such tough-nut classics. Satazius is well worthy of the tiny price-tag it commands, and whilst it would have been nice to see something a little more adventurous in its design, aficionados will recognise what is still a very good game.